The availability of new mobile devices (tablets and smartphones) equipped with many sensors is changing or, better, enriching the way we monitor and sense the world that surrounds us. The internet has permeated completely not only our scientific and technological development, but also our life. Only some years ago, we used geospatial data and GIS software installed within our computers. Nowadays, data and operators are provided via the net by means of distributed and shared geo-services and a simple and powerless mobile device is enough to connect them. The possibility of interaction has become not only faster and more user friendly but also active, being individuals and communities free of adding, deleting, and changing contents in real time in the new GeoWeb2.0. This chapter explores GeoWeb2.0. Web 2.0 has been rapidly changing the way in which geographic data are served and consumed: information sharing, participation and collaboration among users are concepts which can describe the Web 2.0. In this frame people are given the possibility of mashing-up geographic contents and tools, i.e., combining data and functionalities from different sources, in ways original designers had not considered before (Nascimento & Raghavan 2008). And at the same time applications also are becoming distributed, geo-computations will move from local computers to distributed facilities operated by computational utilities and we live in the era of cloud computing, as we will see in the third paragraph. A simple consideration of the success in using geospatial facilities, like for instance those provided by Google (e.g. : Google Maps and Earth), demonstrates the dramatic curiosity and active interest of people in the space where they live. Some authors emphasize this interest of people in geographic information, calling it the “GIS wikification” (Sui, 2008). Lowering barriers to contributing, making easier the interaction and the possibility of participation will result in more photos, maps and other pieces of information uploaded and therefore plays an important role in the success of usage of geography. Several million people are contributing to the growing of this process, called the Geospatial Web (or Geoaware Web) or simply Geo Web (Herring, 1994; McKee, 2004; Scharl & Tochtermann 2007). Some researchers describe the phenomenon saying that citizens act as volunteer sensors creating a global and collaborative patchwork of geographic information (Goodchild 2007a). Many lay people have been approaching environmental and scientific researches with noteworthy contributions. This gave birth to a new discipline, called Citizen Science. To be more precise, Citizen Science, is not really a new discipline, because people have been contributing for many years to scientific researches. It is more correct to say that it is a new name given to an already real practice. As a term, it was added only in July 2014 to the Oxford English Dictionary with the following definition: “scientific work undertaken by members of the general public, often in collaboration with or under the direction of professional scientists and scientific institutions”. The phenomenon of Volunteered Geographic Information (VGI) is one face of this medal, where citizens have become important players by voluntarily contributing georeferenced information about the Earth’s surface and near-surface (Goodchild, 2007). Besides, geo-crowdsourcing has been emerging. This concept, coined by Howe (2006), refers to a work or activity performed by an undefined public or a large network of potential laborers. The merging of the two terms “outsourcing” and “crowd” brought to the crowdsourcing name, to which the prefix geo- is added every time the location is a relevant attribute. 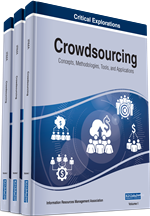 Compared to VGI, in general, geo-crowdsourcing refers to people who are less skilled and who are sharing and contributing multimedia data more unconsciously (e.g. by sending twitter messages or flick imagery). This is the main difference between these two approaches even if, often, authors tend to use the two terms as synonymous. Examples of collaborative sharing of locative information are for instance the Flickr site), enjoying an increase of more than 2500 geo-tagged photos every second and the OpenStreetMap (OSM) project (http://www.openstreetmap.org/stats/data_stats.html). Contributors upload their individual maps, but also mapping parties are organized to gather mappers for intensively surveying a particular area. Parties, besides specific open mapping courses given in those occasions and annual conferences, increase the spirit of community. People gain awareness of working on something useful and are almost immediately able to visualize their data into the general map. From the technological point of view, there are many free and open source (FOS) tools used in the OpenStreetMap project: part of them are available from other projects (like for instance OpenLayers and PostgreSQL; part, like the core which manages the databases, the user interaction and the APIs, were expressly developed for the project and are GPL (General Public License) licensed. From the richness of the information provided, there is there is now a shared opinion that these data, whether they cannot be put in place of, they certainly can be put in support of authoritative data collected by local, regional and national agencies. Not only cooperation among citizens, but also with governments and commercial data providers are part of the collaborative model pursued for instance by the OSM Foundation. The awareness about the necessity of integrating these potential tools for environmental and territorial analyses has been growing at every administrative and governmental level. Spatial data infrastructures (SDI) are the framework for spatial data maintenance, sharing, access and usage. Data generally come in this context from agencies. The SDI implementation improves globally the systems efficiency avoiding data duplication and reducing time and resources needed to search for the existing spatial data or to establish whether they may be used for a specific purpose. The SDI data providers are at the moment GIS experts because a high skill is required to create a new data server and this approach, at the moment, can be considered as a top-down one. In fact the emphasis is focused on providing reliable and updated data necessary for supporting the decision-making policies and activities. Nevertheless the spectrum of possible actors has been spreading in recent years and the two approaches (GeoSpatial Web and SDI) will find a common point, enriching each other with the best aspects they present nowadays.